Designed for use in applications requiring an actuator to be locked in position, Pilot Operated Check Valves allow free flow from the input port through the output port. Supplying a pilot pressure to the valve allows flow in the opposite direction. Pneumadyne's Pilot Operated Check Valves are ideal for reliably holding an actuator position in a variety of applications. These rugged valves feature a 1/4 NPT output port which mounts directly on a cylinder, minimizing space requirements and easing tubing installation. The input port swivels to accommodate valve alignment and contains a 1/4 push-in connection to speed tubing installation. 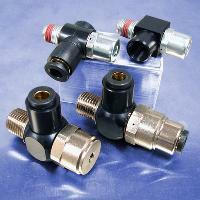 10-32 (F) and 1/4 push-in ports are available to fit plumbing specifications. Contact Pneumadyne for more information pertaining to our pilot operated check valves.